Michael Buckley previous books include a New York Times bestseller, a Kirkus Reviews Best Fantasy Book, and two Oppenheim Toy Portfolio Platinum Award winners. He has written and developed television shows for several networks. He lives with his wife, Alison, in Brooklyn, NY. Peter Ferguson is a comic book and editorial artist living in Montreal, Canada. In the long-awaited fourth book in the New York Times bestselling series, the Grimms take on New York City! Surprises abound for Sabrina and Daphne Grimm, fairy-tale detectives extraordinaire. When they venture into the big city, they stumble upon a murder, face betrayal by a friend, and discover an amazing secret about their mother, Veronica. Sabrina just wants to be normalâno detecting, no dangerous escapes, and especially no Everafters. Unfortunately, New York City is a hiding spot for many famous fairy-tale folk. And thereâ™s a murderer in their midst! The girls and their friends must figure out who killed Puckâ™s father, King Oberon, while coming to terms with their motherâ™s secret life. Will they stop the murderer before he or she can strike again? And will Sabrina ever accept her familyâ™s destiny? 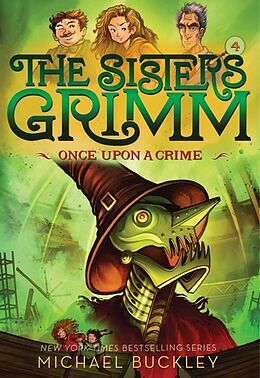 The colourful world of the Grimms expands in new and hilarious directions in Once upon a Crime. Critics and readers alike have embraced the Sisters Grimm series and its independent, quick-thinking heroines. Michael Buckley’s previous books include a New York Times bestseller, a Kirkus Best Fantasy Book, and two Oppenheim Toy Portfolio Platinum winners. He has written and developed television shows for several networks. He lives with his wife, Alison, in Brooklyn, NY. Fans of fractured fairy tales will be delighted to discover the fantasy, mystery, adventure, and humor in the beloved New York Times bestselling Sisters Grimm series by Michael Buckley, now with new cover art. The nine wildly popular books are favorites around the world. They were among the first books to bring a distinctly girl-power spin to fairy tales—a trend followed by hit television series and movies such as Grimm and Maleficent; the bestselling book series the Land of Stories; and more. Now, books one through six in this smash-hit series appear with new covers, with books seven, eight, and nine available as revised editions soon.